New Year's Eve. Keeping an eye on the Twilight Zone marathon, got my Chinese food. Important traditions being maintained. This time of year I also usually have to deal with grading, and I spent hours on that today. The good news is that the class grades are now done, though I will want to double check the math before I submit them, due in a few days. If all I had to worry about was the art, I'd have been done well before now, but the university likes to pile other stuff on top of these classes, things with no relation to art. I'm glad to be done with the stuff I needed to do for semester grades, but I still have hours of other evaluating to do, but I have a few weeks to get that done. This is also Christmas card season. Finished coloring four more today (from the batch I started coloring at the Studio a few days ago) and got two out before New Year's Day. That's something. Prints- Once again, not nearly as many as I would have liked. 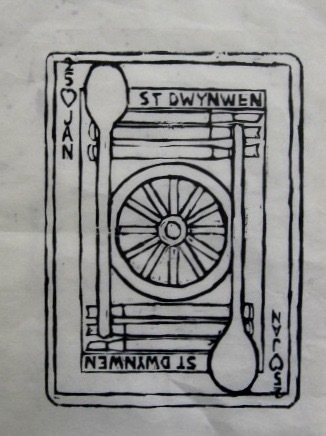 Conceived, cut, and proofed the block for a new saint of sorts, my St Dwynwen print. Coloring will happen in January. This year's holiday card was also completed all in this year. Another print that was completed this year was my mermaid print, image derived from a relief sculpture I completed this year, and a print from that piece of wood was done completely this year. I finally started work on my Circus Drive In print so that should be done in 2019. Shows- Luckily the lack of new prints has not hurt my exhibits. Having a large inventory helps. Had work in a few shows in Belmar, a show in Spring Lake related to my Belmar connections, a show at the Jersey Shore Arts Center that was up for a few months, and a Faculty Show at my university. I believe it was 9 prints total, all different. Teaching- Had my usual university classes, plus advising my advanced independent woodcut student who finally had his BFA show. Had a bunch of other classes this year in other places- two rounds of woodcut classes in Belmar (10 students total), plus two linocut workshops in other places. Was a busy summer. Studio- Had some Studio visits this year. College classmate Jenny came up from Virginia for the third time in three years, officially to pick up some boardwalk prints she had ordered on her last visit, but I think that the opportunity to walk the local towns and eat local pizza were a big part of the lure. 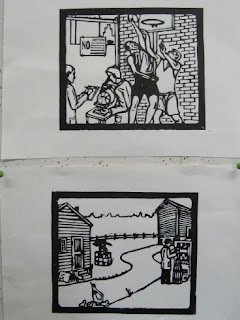 And a long in planning visit from a local woman and her printmaker cousin from Brooklyn finally happened this fall. They seemed impressed, so I guess it was a success. Jackie's move out gives us a little more space, though Molly tends to fill it every chance she gets. Firsts- Actually not my first time helping to put together a show, but over the past few years I have been heavily involved in something called East Meets West, a show organized by my former woodcut student Mary and her former college classmate (from 50 years ago) in Portland, OR. Last year I was helping them toward a show in Belmar, but this year they decided to move it to the JSAC and it's scheduled to happen in early 2019. Don't know if it will lead to anything else, but it might. Next year- Well, it's getting late. I'll save that for tomorrow. People who know me know that my Christmas cards rarely arrive in time for Christmas. Mostly because of my work schedule, in which the colleges I teach at like classes to run up until just a few days before Christmas, to be followed by grading requirements, which come with a deadline (fair enough- students deserve to know) and more demands every year. Plus, for decades now I have been making my own cards, kind of an artist thing, and then writing them out by hand. I begin the process early, and have a goal to get at least one printed and colored in time for Christmas Day, so I can post it here, and this blog will show how I met that goal if anyone cares to look back. This year I had picked the idea weeks ago, drew, cut, and printed the block during the week before Christmas, and had one colored by Christmas Eve. Photographed that morning, so I could post it to the web between the morning presents and the late day dinner. A few family members have theirs now. Cards that will need to travel by mail are still a work in progress. Had the whole batch printed last week, but coloring is still in progress. Yesterday's visit was devoted to printing, but today I was there to color. I decided that one of the cards I had was a little bit smeared, but that left 6 usable copies to be colored, enough for the people I currently owe or promised cards to. In the interest of efficiency, I apply a color to the appropriate pieces of the whole set, then move on to the second color. Not being sure about the status of the Studio over the holiday, I had brought all my watercolors home last week, just in case, and colored the first few to be distributed at home. However, with big tables and fewer distractions, working in the Studio is always better. Took all the paints, the blank cards, and headed up there in the afternoon. When I got there I realized I had forgotten to bring my water can (a canned macaroni can I have been using since I quickly needed something in time for watercolor class back in the 80's) and my brushes. Found an empty plastic cup on Molly's table, and a few brushes in my cabinet- not the best sizes, but would allow me to do some work. Some parts would requires more fine brushes than I had today, but I was still able to apply 8 different colors to the cards today, then packed everything for the trip home. I can do the remaining colors with better brushes at home, and likely still get them in the mail before New Year's Day, still within the holiday period as far as I am concerned. Weather reports are that tomorrow will be a miserable day, a good day to stay home, finally finish all the grading (mostly complete, but all those papers take a long time to get through), and get my cards all colored. There's been a tradition in Belmar in recent years that the debut show of the calendar year is a Salon style show, meaning it is for members only, and at the opening artists are invited to present their work to the crowd and answer any questions. Often there is a theme, and for 2019 it will be humor, one we've had before. This is an open show, meaning that anyone who pays the entry fee and provides something that meets the requirements gets in. The one obstacle I saw was having something new to put in. With classes going through the end of last week, cards to make, the East Meets West project, holiday stuff, and everything related to the end of the fall semester and preparing for the spring semester, I didn't feel I had time to create anything new, and there isn't much I haven't shown there already. A few weeks ago I was down in my parents' basement, my previous studio, looking for something else in my art rack, and ran across some old blocks I had forgotten about. Didn't think about it at the time, but later I realized they might be the answer to that show, so while visiting there last week I retrieved them from where they were. It was an old project, from shortly after I had returned to New Jersey, influenced a little by my time in grad school. Once upon a time it had been printed and colored, but I no longer have it, probably lost in the Hurricane Sandy flood, though I may have a slide of it somewhere. It was a group of prints that were influenced by the concept of semiotics, the study of symbols and meanings, and the effects they can have, a concept covered in a class I had shortly before leaving Carbondale. A part of contemporary art theory, but heavily used in advertising over the past few decades. If a picture is worth a thousand words, pictures used in artworks and advertisements can add a lot of content to an image, hitting the viewer at both a conscious and unconscious level. These pieces were influenced by advertising, both the vintage stuff that I always enjoyed, and some contemporary stuff at the time, about 20 years ago. I got the idea of combining both, something I see humor in. So today I pulled proofs, one from each block. After they have a few days to dry, I'll color them both, and if I like one of them enough, I'll shoot a good digital image of the result, pop it in a frame, and submit it to the show, due in about a week. Both pieces are about combining various symbols commonly found in advertising, each carrying symbolic meaning, but very incongruous when used together. I'll save those specifics for when they are finished. Woke relatively early this morning, took care of some bits of business, then got myself up to the Studio. Giving the rest of my Christmas cards another day to dry, but there's always something else to work on. Today that will be pulling some proofs. I had carried my Dwynwen block to the Studio the last few times I was going there, but each time I decided there were too many other things to get done that day and put off proofing it. I had even brought paper, which I left there. More time today, so that was first on my list. Still had my printmaking bag in the car, so that came into the building as well. 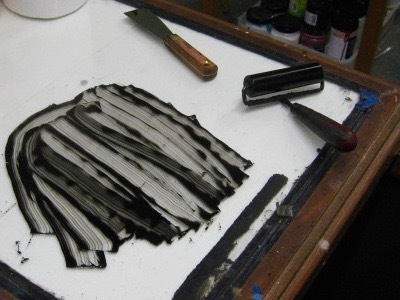 The Dwynwen print is mostly thin black lines, so easy to ink and print. This was a quick practice proof, with a few flaws, but the design seems fine. It will do for the purposes of practicing with my color choices and seeing if they work as expected. The print is not due to the intended show until February, so I have plenty of time to print a better copy, color it, sign it, and deliver it to the show, which will be in the same building. It was a lot of work, but it got done. Much of the story has been told on this blog already. This idea of basing my holiday cards on historical works of art goes back to when I was still in grad school. Gives me a direction, but every year I have to find a new work that is suitable and that I haven't done yet. Sometimes I base it on something I have recently seen in a museum or some other recent connection. But no museum visits for me in more than a year. A recent Christmas letter from my friend Doug mentioned a plan to go to Vienna during his break, and maybe to look at some Schiele paintings, which led me to look at some Schiele and other early 20th century art from Vienna. Actually used Scheile once before, but couldn't find any other pieces that seemed suitable to my working method, or among his contemporaries. So back to my large collection of art books. Decided to try Edward Hopper, who I had used once before, a winterized outdoor scene. 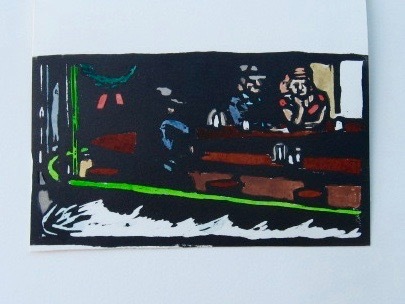 I decided I might be able to so something with Nighthawks at the Diner, possibly his best know piece, and one of the most iconic American artworks. I suppose I could have put a Santa costume on one of the patrons, perhaps taking a break from his delivery route, or from time in the workshop, but instead I just kept the patrons as they were and winterized the scene a little bit. The best known part of the painting is the part inside the diner, but it is only a small part of the whole painting. However the cards are designed to fit in a small check mailer envelope, and much of the light in the original piece comes form parts cropped from the card- other parts of the diner and the empty sidewalk outside. Part of the reason I was considering switching to something else a week ago. But I couldn't think of anything else, committed to this idea, and figured out how to handle it. The value balance of what is depicted very much matches the same parts of the original- we just don't get to see the rest of the painting. The snow on the little bit of sidewalk that fit into my card helps, and the darkness and isolation of the big city is an important theme in Hopper's work anyway. What is shown is telescoped just a little bit to fit it all in, and except for the guy down behind the counter (too far out of range to make this tight cropping), what most people remember is all there. The only significant change is a wreath inside and snow outside, all to set the season. Block drawing completed by midweek, final cutting and printing done by Thursday, colored last night so I could have one for this site and for family today. The others could use a little more drying time, but I expect they will be done by the end of this week. Merry Christmas! Got up early again this morning, and prepared several more small card sized pieces of paper. The sheets I had pulled out and started flattening last night included a piece of Rives Heavyweight, and a very heavy buff cold pressed paper, left over from the community college. Plus I had all the card sized pieces of the bristol board type paper from yesterday, since all I had tried yesterday were the small scrap pieces. After my usual morning routine and some other errands, I got up to the Studio in late morning, carried a bunch of stuff down to my space, and got to work. First task was to finish grading some student works that I had received last week, since they will have to be returned tomorrow. That was quick. 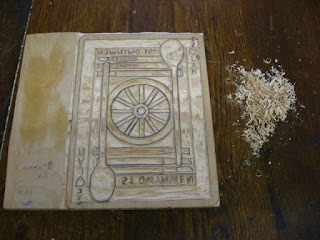 Second was to do more block cutting on my Christmas card. Looking at yesterday's results, one solution would be to cut more out of the figures- faces, bodies, hats. I had thought my cutting was accurate to the drawing, but I think some ink filled in a little bit. Unfortunately, there is still ink on the block, so redrawing it in pencil isn't really possible. Used my inspiring painting as a guide and did what is sometimes called drawing with a cutting tool. Next step- get this thing printed. 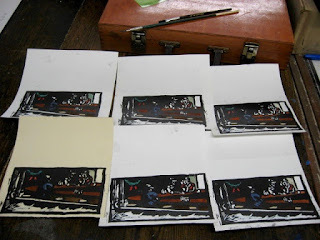 Same ink, brayer, etc as yesterday. The buff paper (probably a water color paper) is substantial, heavy enough to make a good holiday card. However, being so stiff and rough, not easy to hand print. Had three prepared pieces, but they didn't take relief printing well, eventually shifting on the block, so I ended up with just one acceptable proof. Which is one more than I had yesterday. I had two pieces of the white Rives Heavyweight. heavier than the one we usually use in class, but not quite card stock, and relatively soft. May not be stiff enough to work as a card in an envelope, but would work for a photograph. As I knew it would, it printed very well. 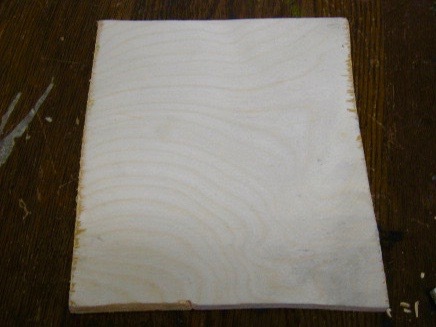 Next up, the prepared pieces of bristol board. Dead white, the smoothest surface of the three papers I was trying out, but it's stiffness makes it tricky sometimes to keep in position. Yesterday they all shifted on me. Today, with the card back to help hold it down, I was able to print several acceptable copies. Each retained nicely the newly cut image. When all was done, I had 9 acceptable proofs, on 3 different kinds of paper. I packed all of them for the trip home. Once again I decided to put off proofing my St Dwynwen print, and I had been informed I wasn't needed for babysitting duty, so I was able to take my time cleaning up, and got out of there with all my stuff before any major rain came. Took all my watercolors home as well, but that will have to wait until the ink dries a little, sometime next week. Was up early this morning, so I took care of turning my large piece of paper into many small ones- 9 card sized pieces and a few scraps too small for a card. Packed up as much other stuff as I thought I could use, and got up to the Studio. First step was to finish the cutting of the block. Very detailed work, taking a little longer than I expected, but I got through it and it looked good. Took a break to talk to building management about some stuff we had discussed a few days ago, then on to the inking. Had enough paper to print all the planned copies, but also had to make sure of what I had first. Somewhere I have more ink and brayers, but haven't been able to figure out where they are yet. Luckily I had packed my last new can of ink, and I had some brayers in the printmaking bad I had brought. Decided to test things out on some of the scrap pieces first- large enough to print the relief image, but not large enough to be the whole folded card. There were a few issues, some related to the stiff paper, some because this was the early printings. And I didn't really like any of the brayers I had, which either gave me not enough ink or too much. Well, the practice ones will have use when I am practicing colors in a few days. So far the piece is kind of dark. My source piece is set at night, so that's not a total surprise. And the overall balance of light and dark feels fairly accurate. However, the three figures in the image all seem too shadowed. I know what they are, but new viewers may not see them properly, even after I color them. I think the only solution is cut out more of their images, so there will be less black printing, but right now the block is still quite inky. Blotted it a few times, and I'll let it dry overnight, so maybe it will be less messy to cut tomorrow. Maybe a different paper- something with a softer surface, but still heavy enough to be a card. I may have something available in my collection of supplies, enough to get a prototype for Christmas Day. In any case, I decided not to try any more card printing until I figured out where to go with this, or to proof the St Dwynwen print yet, since that's not needed for a few months yet. Meanwhile, took everything home to consider in the evening. And left some other heavy print paper sheets to flatten out overnight. Got up to the Studio about the same time I did yesterday. 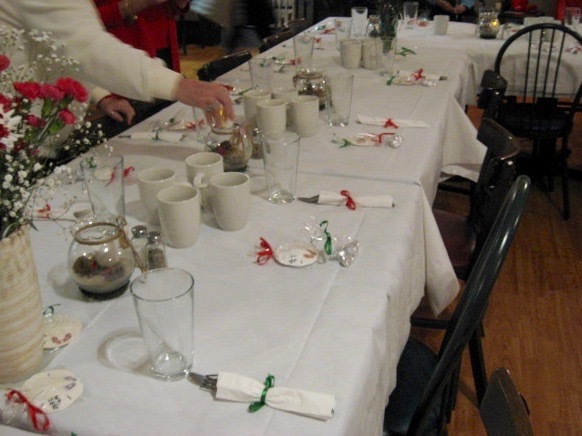 No big lunch scheduled today, but in the past, events like we had yesterday, which ended up with large amounts of food leftover, sometimes resulted in lots of leftovers in the downstairs kitchen for the tenants to share in for another lunch. Figured it couldn't hurt to look into it. Unfortunately, all the hot food items were locked away in the 3rd floor kitchen and would stay there today. They may come out tomorrow, though a lot of the other volunteers may show up to get them, too. Not a problem today, as I had brought some food with me to eat. And still there was a bonus- the dessert stuff had been put in the downstairs fridge, so I was able to grab a few cookies and a small piece of cheesecake to accompany my lunch. But my real reason for going was to work on my card, with Christmas Day just a week away. Some extra preparation this time. Walked to the drug store on the corner and bought a few erasers, as the one I had was not cutting it yesterday. And brought a better pencil from home and a decent pencil sharpener. By the end of the day yesterday, after I had to erase the whole Not backwards sketch I had done, all I had gotten to was a rough blocking in of the figures and architecture of the setting, and that's about it. 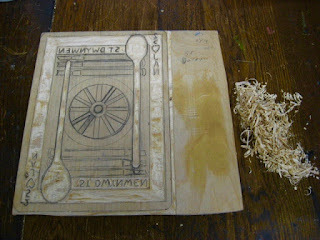 With my upgraded supplies today I was able to fly through the process, finishing the block drawing by early afternoon. My chosen inspirational artwork, and the section of it that I will be making use of, includes a lot of dark sections, which will end up as black (uncarved) sections of the block. So in less than a half hour, I was more than half done with the cutting I will need to do. Of course, you don't get to see that design for another week, but these wood shavings on my table represent much of what I removed today. I knew that at home I had several sheets of a bristol board type paper, suitable for what I want to do, so I removed one from the rolled up tube I had and laid it out, so it should be relatively flat by tomorrow. First thing in the morning I'll cut it down into the size for printing a first batch of cards, then by midday up to the Studio to finish cutting the block and pull a few proofs, at least one of which should be suitable for coloring for Christmas Day. And if a few work out, they can be added to those that will be distributed in the near future. Party time at the Jersey Shore Arts Center today. I got up there a little before noon, as I had been told that today there was a big luncheon to attend. Officially it was for the volunteers in the building, but Nichole had let me know in passing that we were all invited, and this was backed by an e-mail newsletter last week. I learned that it would be held in the 3rd floor seating area by the kitchen up there, which is what I had expected. Had a little time, so first stopped at my space in the basement (Molly hard at work on more printing, has some craft show type things going on right now) to drop off some stuff. Molly declined to come join the festivities, claiming to be to busy. Took the elevator up to the 3rd floor. It stopped at the 1st and two volunteers got on, startled by my presence in the car. Soon we were up to the 3rd. When that floor was opened up, we found a large commercial type kitchen had been installed, which Herb told us was intended for teaching cooking skills to the visually impaired. (don't know it was for personal or occupational skills) That program has yet to happen, but it's an excellent space any time they are doing an event like today. Just adjacent to the kitchen is a large open room (once a classroom I assume) that is used for meetings and other event, but today was set with tables, and those tables had tablecloths, rolled silverware, glasses and coffee cups, flowers, and some small party favors- sand dollar magnets and a little bag of Hershey's Kisses. Large pitchers of water and soda were brought around. Food came from tables set up near the opening to the kitchen. Our chef today normally works out of a restaurant in Deal, but did his catering in our space today. There was a large platter of cheese and crackers, and a very large bowl of salad, with a pitcher of salad dressing (oil and vinegar type), then steam trays with penne, eggplant rollatini, a salmon dish, something I was told was chicken with pesto (my scoop seemed to have a little piece of chicken and a whole lot of large pieces of cauliflower, but I eat that, too) and another pasta dish. Served buffet style. We had a good crowd- probably 30 or 40, mostly elderly women. As with the volunteers who got on the elevator, no one knew who I was, and they were shocked to learn that I have had a space in the building for 10 years. The old ladies tend not to come down the the basement. The people who work down there (some of whom were at the luncheon and we all sat together) know who I am. My former student Mary Lane, who regularly came to the critique group, never saw the building above the basement until she had her first meeting about holding the East Meets West show there, so I guess it evens out. Started with a large paper plate of salad, then a large plate of some of the hot dishes, and since there was so much food left, went back for some seconds on the penne and the eggplant. There was so much food I could have had a few more helpings, but I was pretty full at that point. When they brought the dessert out, I did have a few fancy cookies and a small piece of cheesecake, and I knew I wouldn't need to eat tonight. However, it was still early afternoon and I wanted to get some work in. Molly and all her product was gone (I guess the reason she had no time for lunch) so I had the place to myself. I was having a hard time last week with the block drawing for my card, and considered looking for a new idea, and spent all weekend looking through my art books, but nothing inspired me. So today I was back to what I was doing last week. Sketched on paper at first until I think I knew how to convert the original painting to my card idea, then started drawing on the wood. Had to stop and erase it all when I realized that my block drawing was still oriented like the original art, and started a new mirror version. Worked out some of the basic composition, then decided to call it a day. Probably go back tomorrow. This morning I found e-mail from Mary, co-creator of the East Meets West show. She's about to go away again, but at least she's fine. Meanwhile, work continues on the print for the show. I put in some time cleaning some of the minor defects from the last session of block cutting, then took on the task of cutting out the space in the border around the whole design. 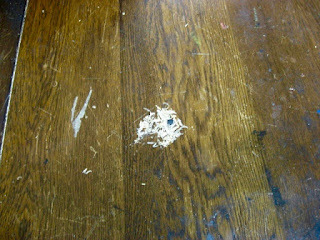 One thing I found in that process is that there were a few knots buried under the wood surface, revealed only as the top layer of wood was cut away. Small knots, but they are there is places where I had planned to cut and they are too hard to cut away, so they will remain. 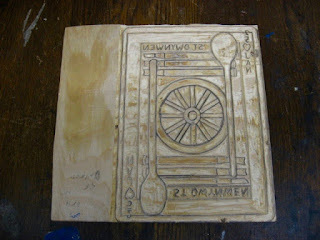 As I tell my woodcut students, that is now part of the new design. I don't think this will be a real problem. 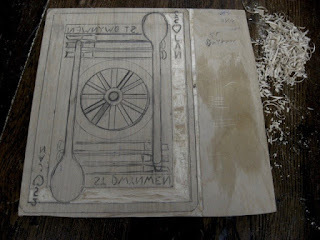 The custom around the saint's holiday (which the image is built around) involves hand carving wooden objects, so a few irregularities in the wood block seems almost expected. I think I may be done. A pencil rubbing revealed just a few minor flaws, but I will try to deal with them soon and then pull some test proofs, probably next week, as I'm printing the prototype of my Christmas card. Speaking of which, when I finished the day's cutting on this block, I turned my attention to my card design, working out the idea in a sketch book. Got a bit discouraged. The cards are small, designed to fit in standard check mailer envelopes, and I don't know if I can fit the important parts of the original painting, plus my planned alterations, all in the small space I would have to work with. If I can't resolve this soon, I may have to come up with a new idea. Back to artwork today. Brought the current block and my tools to the Studio, and had the place to myself today. I had debated with myself over the past few days if I wanted to add Japanese writing to the gouges. The ones I use come with words printed on them, though what was printed has mostly worn off in the 20 years I have been using them. The tools that I drew for the purposes of this block are not exactly what really exists- I used the appearance of the blades, ferrules, and wooden handles, but I added the larger ends of tools that are used with mallets- filled the space nicer. All tools come with something printed on them in kanji, characters absorbed from ancient written Chinese, with many strokes that generally take much of a lifetime to learn (there are 4000 or so for basic literacy). In my limited study of Japanese language I learned to recognize the two relatively small phonetic alphabets (mostly used to spell words derived from other languages), but that was almost 30 years ago. In any case, I can't read what is printed on the tools. I tried comparing the writing on two different models of tools that had the same size and shape blade, but these weren't the same either, so I'm guessing the written words are something else, maybe relating to the handles. Seems best to just leave that stuff out completely. With that settled, I just continued cutting out the block drawing I already had. Cut out the three gouges at each end, then the wheel in the center, then all the negative space within the main rectangle. At some point I will need to go through and clean up some details, but not today. My last main task is to cut out the border around the whole thing, which I don't want to be solid black, so it will have to be hollowed out. Have to deal with some school stuff tomorrow, then I can finish this and move on to my Christmas card. Another week, more student works to deal with. 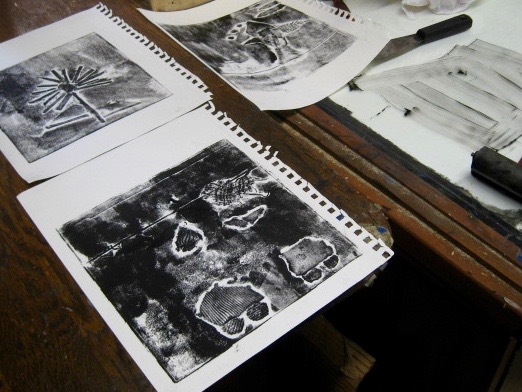 Three more students brought me collagraph plates to be printed this past week. And since the class schedule was rearranged for the coming week, I couldn't wait too long to deal with them So I left by late morning to go up to Ocean Grove and do some grading. Did the whole pile of comic strips from my Intro classes, now that I know what they are supposed to be, which I didn't (in most cases) before last week's critiques. 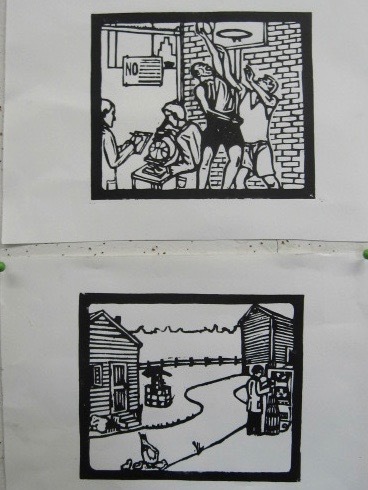 Then I printed three more student collagraphs, so I can return them this week. The students need to add more to them, so I had to get them done now. If more come in this week, I can print them, but they can't finish them. And if I don't get them this week, I can't print them before the semester ends, but that is their problem at this point. Then I did one thing just for me. Last night I got an e-mail from one of my old college buddies that mentioned something about Christmas cards. Since this is one of the few people who still actually send me a card each year, he would be likely to get one. And since I usually have classes until a few days before Christmas Day, the cards don't often come out before January, though I always like to have one done in time to post that day here on the blog. I've already picked out an idea, but you'll have to wait until the 25th to see it. First step is to start a block, so today I took a trip out to bring a load of stuff to the car and returned with a scrap of wood and my scrolling saw. 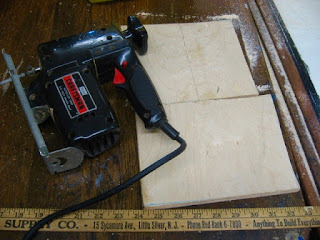 Back in the Studio, I took the small irregular piece of plywood and reduced to to include two pieces the right size to be used in making my cards. What will result? See you in about 2 weeks. Got to the Studio by late morning today, but Molly beat me there. No problem- she was busy adding more layers to her silk screening project, and I got back to work on my St Dwynwen project. I decided to keep working my way around the inside, so matching the cutting from a few days ago of the date and heart, but now in the other corner. 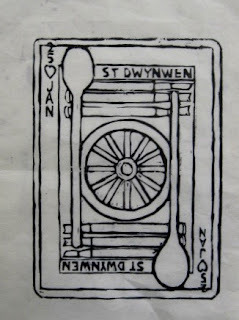 Then in the same way, I cut out the ST DWYNWEN name at both ends, and then the spoons. More to go, but it shouldn't be that difficult and I have plenty of time. Some days you have to set aside art to take care of job stuff. This was one of those days. My income generally comes from teaching art, so that occupies much of my time. I would have loved to be back in the Studio today continuing on one of my current blocks, or maybe starting a new one. I was in the Studio today, but catching up on some school related items. When I arrived the place was dark and locked up. I dropped off a load of supplies for the day, closed up again, and went out to pick up some lunch. Stopped back at my car to pick up another load, went back down to the space, and found the door wide open. Dropped off the new stuff, and was about to go check with the office, but found Molly in the hall, and realized he had been the one to open it back up. So I would have company while I worked on my tasks. One was looking at and starting grading on the major 2D project in my Intro class. They are large and kind of messy (pastels), and I have more space and large tables in the Studio, so that seems to be the place to deal with those. I usually have a full critique on the day those are collected, which provides a chance for the students to explain what they did, but other circumstances (university related) only allowed be to collect them. Was planning to try grading them today (at least the ones I had, as many students didn't turn them in yet), but in some cases I had no idea what they were trying to do, a problem in an assignment where narrative is a major factor. The new plan (as told to the class last week) is to have the crit this week, hoping more pieces come in. I think grading would be best left until I know more about the pieces. At least I was able to mark down which ones were turned in on time. 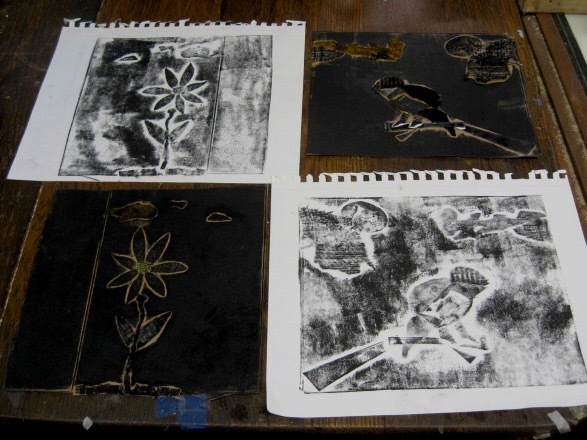 More productive was work on the collograph project. I have long had a policy of introducing print projects into all my classes, wherever appropriate to the class and level of students. In my 2D classes (going back to grad school) we do woodcuts, in Drawing class (again going back to grad school) we do monotypes, and in the Intro class it's collographs. All the students need to bring is glue; all the rest is things they have in their kits or things I bring in for them to use- cardboard and old fabric scraps to make the plates. 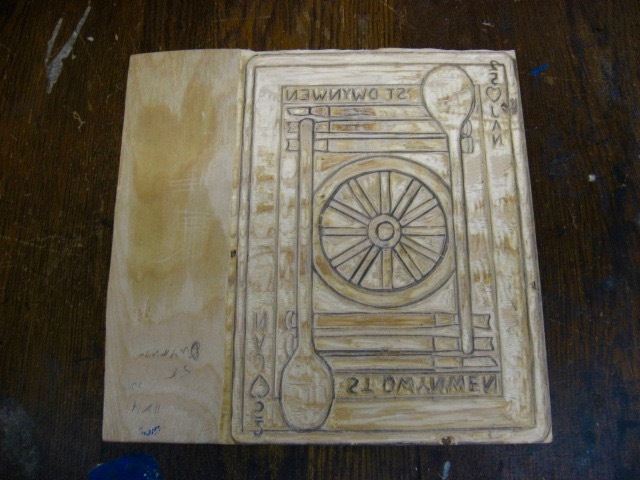 Plates were made several weeks ago, and a few weeks ago I brought in ink and printing tools to print them. Color and more collage will come from students after that. Of course it is inevitable that some students are absent, or don't have the plates on the day we print them, and this is one project that they can't do without me. The best solution I have is to collect the plates, and just print them in my Studio, then bring them back to the following class. Last week I had two students bring me such plates, the two pieces you see above. Done with water based ink, they will be dry when I return them in a few days, giving the students a few weeks to add their final part before portfolios are graded. The problem is we are running out of time. Students who bring me plates next class can get the same deal, but after that there just isn't time to print them and get them back to the students to add their last part before the semester ends. Well, they've been warned. One thing I had learned from Molly is that there were new padlocks for the gate, and if I wanted a key (and they are useful to have) I had to get one from the office, so on my way out I stopped off to see Nichole and got one. It's been a long time since I was in the building by myself and needed to open the gate to the building, but the holidays are coming, so it's probably good to be prepared just in case. Been a while since I worked on this block, started in late spring of this year. (details are covered in posts on this blog from this past February and April) This was always intended as my contribution to the East Meets West print show, and with that exhibition being pushed back, the cutting of the block was not a priority. But now that show has taken its place as the next one on my schedule. Still months away, but those will likely be busy months, and while this medium-small block shouldn't take long to cut, I decided it's a good time to get this business going. No changes made to the block drawing since early this year. The one problem I had today was that I thought the bag I grabbed included my cutting tools, but it only had the student tools I use with my woodcut classes. These are decent tools, and had been checked and sharpened before the last class, but at best they are not going to be as good as my personal set. Still, I was able to get a start on the project and am confident it will all be done in plenty of time for the show.